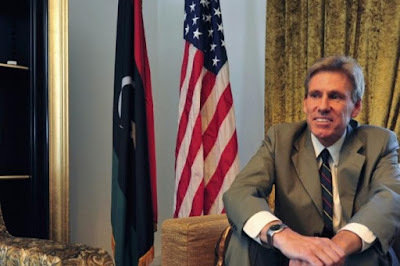 Ambassador Stevens and the 3 other deaths in Benghazi was no accident. He was exposing Hillary and Obama when he got back. Amb. Stevens was sent to Benghazi post haste in order to retrieve US made Stinger missiles supplied to Ansar al Sharia without Congressional oversight or permission. Hillary brokered the deal through Stevens and a private arms dealer named Marc Turi. Then some of the shoulder fired missiles ended up in Afghanistan used against our own military. It was July 25th, 2012 when a Chinook helicopter was shot down by one of our own Stingers, but the idiot Taliban didn't arm the missile and the Chinook didn't explode, but had to land anyway. An ordnance team recovered the serial number off the missile which led back to a cache of Stingers being kept in Qatar by the CIA. Obama and Hillary were now in full panic mode and Stevens was sent in to retrieve the rest of the Stingers. This was a "do-or-die" mission, which explains the stand down orders given to multiple commando teams. It was the State Dept, not the CIA that supplied them to our sworn enemies, because Petraeus wouldn't supply these deadly weapons due to their potential use on commercial aircraft. Then, Obama threw Gen. Petraeus under the bus after he refused to testify that he OK'd the BS talking points about a spontaneous uprising due to a Youtube video. Obama and Hillary committed treason...and THIS is what the investigation is all about, why she had a private server, (in order to delete the digital evidence), and why Obama, two weeks after the attack, told the UN that the attack was because of a Youtube video, even though everyone knew it was not. Further...the Taliban knew that this administration aided and abetted the enemy without Congressional approval when Boehner created the Select Cmte, and the Taliban began pushing the Obama Administration for the release of 5 Taliban Generals. Bowe Bergdahl was just a pawn...everyone KNEW he was a traitor. So we have a traitor as PresidentOfTheUnitedStates that is not only corrupt, but compromised...and a woman that is a serial liar, perjured herself multiple times at the Hearing and who is running for POTUS. Only the Dems, with their hands out, palms up, will support her. Perhaps this is why no military aircraft was called in…because the administration knew our enemies had Stingers. Send again and again and again until everyone reads this truth. Our nation depends on people getting the TRUTH, instead of the pack of lies being fed to us by Obama and Clinton.